I read something the other day on a wedding planning Instagram page that really didn’t sit well with me. This page was encouraging soonlyweds to lie to vendors and act like they were planning a fancy birthday party in order to get cheaper rates, because apparently all wedding vendors are just out to price gauge and screw you over, as though we just make up our rates for fun. That’s not how it works. I promise you, wedding professionals are not sitting there mischievously like Mr. Burns, concocting ways we can throw in hidden fees and taking you for all we can get. There is a lot that goes into our rates, and yes, wedding makeup and anything having to do with weddings typically costs more. Why? Let’s talk about it. First of all, weddings can be stressful and time consuming. There is a lot of back and forth when planning a wedding, from meetings to emails to last minute changes. The amount of time I spend communicating with clients - discussing their needs and wants, drawing up a contract, answering every question over the course of their wedding planning period, etc. - it adds up. Most people in a “normal” job don’t work off the clock, and wedding professionals shouldn’t be expected to, either. You may not see it happening or even think about it, but this behind-the-scenes office-type work also has to be accounted for when it comes to our rates. Weddings take more time: more time the day of the wedding, more time behind the scenes. Soonlyweds get very personalized attention because this is one of the biggest days of their lives, and trust me, we care as much as you do about your day and we want the best for you. We put the time in for you because we know how important it is, but we have to charge accordingly. Of course, coming from a makeup artistry point of view, the products come into play. My kit costs are very expensive. A lot of that stems from the non-reusable items like sponges, mascara wands, and lashes. Say I’m doing a large wedding party, I can go through an entire sleeve of cotton rounds (especially if some of the members are still rocking makeup from the night before and I have to use half a bottle of Micellar Water to get it all off…). Replenishing our kits adds up very quickly, and we go through items faster when doing weddings. We’re not just makeup artists, either. Sometimes we have to be gentle mediators (like when your Maid of Honor wants a heavy party look but you're wanting everyone to look more natural), sometimes we have to play stylist and zip up dresses or cut off tags - all of which is part of providing our clients with the best experience possible. I don’t show up to a wedding, not talk to anyone, do the makeup, and leave without a word. I do whatever I can to make the time you’re with me feel as luxurious and relaxing as possible. Part of providing such an experience is charging appropriately for it. If I charged $40 for everybody’s makeup, I honestly wouldn’t be very happy about being there. That’s not enough to cover my business expenses nor my time, and I would feel discouraged very quickly; in turn, my attitude can totally ruin your experience on such a special day. But I know you’re paying me what I’m worth to be there, and I will be damned sure you get your money’s worth! Business expenses, kit costs, the experience, and time are all part of our rates. Weddings take more of all of those things, so they cost more. And usually, you get what you pay for in these circumstances. I hope I’ve cleared up some misconceptions when it comes to wedding costs. I know everyone is on a budget but maybe it can ease your mind knowing that wedding professionals are not just trying to pull one over on you. Short version: I saw a pretty girl do her makeup. Decided I wanted to look like that. Watched YouTube. Went to aesthetics school. Built my dream. Voila. Sounds simple enough in the short version. But the long version is that I was a messed up girl trying to find her way, and I failed a lot before ending up where I am now. As cliche as it is, I made a lot of mistakes in my life but it truly did work out for the best. It was 2014. I was an alcoholic and a drug abuser, pretending everything was okay and that I was just a fun-loving party girl. Deep down, I felt broken. But I had been this way for years at this point, so "it's just who I am," I thought. I had addiction issues, I was aimless, hopeless, depressed. That's just how it goes for some people, right? I didn't even realize that I could make a bright future, but to be honest, I was so wrapped up in destroying myself that I didn't want to make a future anyway. Then one day, I up and decided to go to Guam. I was 24 and a friend had presented the opportunity to me. I had just started dating my (now) husband, and although he was trying to "fix" me and help me through my issues (bless him), he knew he couldn't keep me from going. I was always looking for the next wild ride, so off I went! I worked at a club on Guam for the few weeks I was there. My alcoholism got worse but hey, I didn't know anyone to get me any drugs, so I had that going for me, I guess. Everything is a bit of a blur for me during this time, but I do recall asking one of the club girls with whom I worked: "How do you make your face look like that?" Not my most eloquent moment, but what I meant was: how did she make it look so effortlessly flawless? Luckily, she didn't take offense to my weird question. She told me she was studying makeup at a school, and that I should go get a makeup lesson at the local MAC counter. Alright, cool. Wait, what is MAC? I wore pretty much exclusively CoverGirl and I didn't even know there were brands outside of the drugstore! But I made an appointment and honestly don't remember much about the lesson except that I ended up dropping $200 on makeup, and hating the makeup look the MAC girl put on me. It looked so heavy, compared to what I normally wore. This worked to my benefit though because now I keep this in mind whenever I'm doing someone's makeup. Okay, so fast forward a few days and cue a wild, drunken mental breakdown - alone on an island where I didn't really know anyone. I won't go into details but it was a really bad time in my life. My (now) husband ended up quickly selling some household items so that he could afford the $2,000+ flight to get me home ASAP. I was back in Tennessee on the promise that I'd get sober. My husband saved my life and I'm forever thankful. Maybe it was fate how it all happened - going to Guam, getting that lesson, and reaching my absolute rock bottom... That $200 splurge ended up creating a passion for makeup which in turn helped me focus on something other than my newfound sobriety and how much it sucked! It gave me something to fill the void that I had previously been trying to fill with substances. I discovered the vast world of makeup tutorials and became obsessed. I learned so much, my makeup collection grew, and I decided maybe I would love to do this on other people! This could be the path for which I was desperately searching! I could finally make something out of my life. Being a two-time college dropout, it seemed I had found something that I could imagine doing forever. And since makeup artistry is so much more than playing with fun colors, I wanted an actual education. I put my two weeks' notice in at the hotel where I was waitressing, and enrolled in aesthetics school. Best quick decision I could have made! I fell in love not only with makeup, but with skin care and the whole process of making people feel pampered and beautiful. Maybe because I was so used to being a source of chaos in my own life, it was nice to be a source of comfort for other people. My favorite thing about aesthetics school was putting clients to sleep because my facials were so relaxing. There is no higher compliment! I graduated, got licensed, and began building my freelance makeup artistry business into what it is today. You know, it's crazy to think that was just 3.5 years ago. So much can change in a short amount of time. If I were to give any advice to someone looking to start working on their dream, it's this: don't give up. Yeah, that's cliche, but it's true. There were so many times I felt down and discouraged, like I wasn't good enough, and maybe I couldn't do this after all. I compared myself to other artists, which made me feel inferior and like I should just give up because I'll never be *that*. But guess what? *That* is not what I want to be, which is certainly a good thing. I have my own style, my own goals, my own passion. You don't ever need to compare your work to someone else's, because there are clients out there looking for someone like YOU. Focus on yourself. Take inspiration from others, but always believe in your own capabilities. You have no idea what tomorrow will bring, but you'll never find out if you don't get there first. Get yourself together, and focus on what you can do just for today to bring your goal a little bit closer. Then do that again tomorrow, and the next day. I never thought I'd go from addicted party girl to flourishing business woman. If you had told me four years ago where I'd be today, I'd laugh and take another shot of Jack Daniels. ... But this is all a bit too heavy to explain to my client on her wedding day, so I just smile. finish applying her blush, and say, "Fate has a way of getting us to where we need to be." Now I'm a loving wife and mama to two beautiful, smart babies. Life is wonderful! ... Makeup Artist, that is. But seriously - for your wedding day (or any special event, for that matter! ), you want to know the person you pick is going to not only make you look and feel amazing, but also that (s)he will be professional, punctual, and sanitary. So where do you start? Well, you can start with Google. "Makeup Artists near me," or "Makeup Artist [Your City]" should pull some good results. The first few results are likely going to be linking you to big wedding planning sites like WeddingWire. Underneath those, you'll find the websites of your local MUAs. WeddingWire and The Knot are great resources, but sometimes the artists on those lists are not even in business anymore or they may not update their listings with new material. You can also search for makeup artists in your local Facebook Wedding groups. Don't count out an artist if (s)he is not in your city. Most of us travel to you, and there may not be a travel fee depending on the mileage. Even if there is a travel fee, a good artist can be so worth it. So, you have a list of makeup artists to choose from in your area. Cool. Now take a look at each of their websites. And I mean an actual website, not just a Facebook or Instagram page. If they have a well-put-together website, it shows they are really invested in their business - it should showcase their work and provide more information very clearly so you know how to contact them. Of course, some artists in this day and age just stick with a social media portfolio and do awesome with that, or if they're just starting out they may not have a website up yet. Or they work out of a salon so they don't have their own site. I understand that and it definitely doesn't prove whether or not someone has talent. So maybe I'm old school, but for freelancers, I think having a website is crucial to showing what you offer and it reinforces that you're a professional. It also helps the client get a feel for the vibe and style of the artist. Most states require either an esthetician or cosmetologist license in order to do makeup. I know Tennessee does. To some clients, whether or not a makeup artist has the required license is not a high priority as long as the artist is good. Most of my clients don't even know that Tennessee requires you to have at least an esthetician license. And I'll note: a license (or lack thereof) does not make someone a good or bad artist, but it does show that they have invested lots of money and time into their education to follow the proper protocol for their state. They may also know more about how to be sanitary when working on clients, although any makeup artist who takes their career seriously is going to be a stickler for sanitation. Someone with a license is likely not a "fly by night" MUA who decided to wake up one morning and start doing makeup on people. A license shows that they have put months/years and lots of money into this and have taken state board exams in order to become a makeup artist. Website? Check. License? Check. Now how's their actual work? Their portfolio should consist of several professional photos, not cell phone pics or selfies. A good place to see before&afters or cell phone pictures of clients is on social media if your artist has one for his or her business. Your artist may just be starting out so their port won't be huge. Are you down with helping them build their business or would you prefer someone with more experience? Keep in mind, someone with more experience will (or should) charge appropriately for it. Speaking of charging... the next step is to determine if the artist is within your budget. I know you may have sticker shock when seeing how much hair and makeup costs for weddings, but remember that how you look is going to be captured in photos for... forever. I do think hiring a quality artist is very important - and I'm not just saying that because I'm biased! Of course, everyone has a budget. You may fall in love with an artist only to discover that the rates are more than you were expecting to spend. A good artist is worth her (or his) rate, trust me. We put a lot of our time, effort, and soul into our businesses and we can't make a living to keep doing this if we don't charge appropriately for our talent, our kit, and all the fees associated with running our business. If you find someone charging, say, $30 for makeup services, really consider what they can offer by charging so low. You can't stay afloat for long or invest in a quality kit if you're basically losing money with every service you do. Check reviews and ask around in your social circle or Facebook groups. You'll likely get some honest input from those who have used the artists you're considering. And once you're ready to email the MUA - pay attention to the response time. Do you wait days and days for a response? Or do they answer within 48 hours? Now, the weekend tends to be our busiest time so cut the artist some slack if they don't answer you until Monday or Tuesday. I try to get back to potential clients within a day, but sometimes my day is jam packed and I can't find a minute to respond right away. Also, is their response helpful and insightful? Are they answering your questions thoroughly or leaving you confused with even more questions? Communication is another huge part of the wedding planning process so you want someone who is going to show commitment and care to your big day. I know it can be overwhelming trying to find all the right vendors to fit your needs and your budget. I hope this article helps you, and maybe even puts into perspective what all comes with hiring a real professional for your beauty needs. I have a few dates left for 2018, and am already booking for 2019. Ready to book? Have questions? Your vendors are booked and you're all set for the big day... except for one thing: The schedule. How on Earth are you supposed to know who needs to be where, and when? Between hair, makeup, and photos, it's important that things run as smoothly as possible before your ceremony (I mean, duh). First, speak with your photographer. Will he or she be on hand to capture your party getting glammed up? What about First Looks before the ceremony begins? Family pics? Wedding party photos? How much time does your photographer need if you are taking photos before the ceremony? The photographer should give you times of when (s)he is going to arrive, start taking the photos, and what the photography schedule will look like. Now, you can start planning around everyone else. The next step is to ask your makeup artist and hair stylist how much time they allot per service. For example, for makeup applications, I save 45 minutes for each bridesmaid and one hour per bride. Hair styling times can vary depending on length of hair and type of style, so be sure to communicate with your stylist about your ideal looks for both you and your party. As far as which comes first - hair or makeup - typically we know how to work around each other. If a bridesmaid's hair is already done when she sits in my makeup chair, I have no issue carefully working around a beautiful hair style without messing anything up. It can actually help having the hair already done so that the client can get the whole look all at once. Have you ever done your makeup but left your hair messy or flat? Yeah, somehow the makeup can sometimes look a bit... "too much." 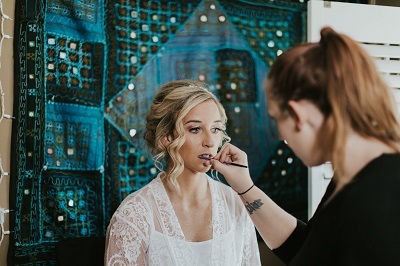 If the photographer is going to capture photos of the party getting ready, you need to schedule yourself in either hair or makeup usually about 20 minutes after the photographer is set to arrive. They may want to walk around and get a feel for the lighting or get the detail shots (such as your shoes, dress buttons, bridal corsages, etc.) before coming and taking your getting ready photos. Of course, if you're already done with hair and makeup by the time the photographer comes around, the makeup artist can simply act like she's powdering you or applying lipstick. And also note that it's better to already have some makeup/hair done than have nothing done at all. Okay, but what happens if hair or makeup goes over the allotted time? What if a bridesmaid can't be found when she's supposed to be getting her hair done? Try and combat these issues by emailing the timeline to each person receiving services and printing out a copy and placing it in the getting-ready suite for everyone to see. Don't forget to send it to your hair and makeup vendors, too! But things happen, and the schedule may get switched up. Of course party members can switch places on the schedule if need be, and as long as the artists know that the schedule is starting to get out of order, we can adjust our timing as best as possible in order to accommodate. Communication is key! Little anecdote: I once had a party member show up four hours late. She showed up 45 minutes before the first photos were supposed to begin. I knew it was crunch time, and I was able to finish her look in about 25 minutes. She then had to go into hair (and luckily she was already dressed for the wedding). But as I was packing up, she was still in hair... and pictures had started without her. I knew we were in crunch time mode but I'm not sure if the hairstylist knew. This is why it's so important to have constant communication about the schedule, and a timeline to guide you throughout the day. Even though the schedule got thrown a bit, we adjust and make the best out of it. She still got to be in some pictures and I hear the wedding turned out amazing. I'm not saying this to stress you, I'm saying this to let you know that it's all going to be okay. Trust your vendors, trust your friends and family, and know that it's going to be okay even if there are small nuances. There's a lot to think about for your big day, so I hope this helps and gives you some guidance for making your schedule. Congratulations! Want to chat about your makeup needs? Makeup Artist in Clarksville, Tennessee. Available for travel.